EDITOR’S NOTE: Updated after confirmation of a successful launch. The Kanopus-V 5 and 6 Earth observation satellites will assist the Russian government in disaster response, mapping and forest fire detection. They were the biggest payloads on the Soyuz-2.1a booster, and were joined by 26 other spacecraft under rideshare arrangements booked by GK Launch Services, part of the Glavkosmos company that sells Russian launch services on the global commercial market, and the German company ECM Launch Services. 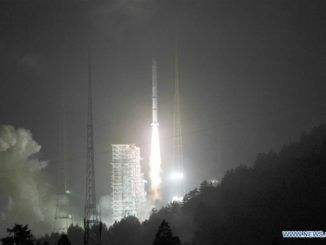 Liftoff occurred at 0207 GMT (9:07 p.m. EST Wednesday). 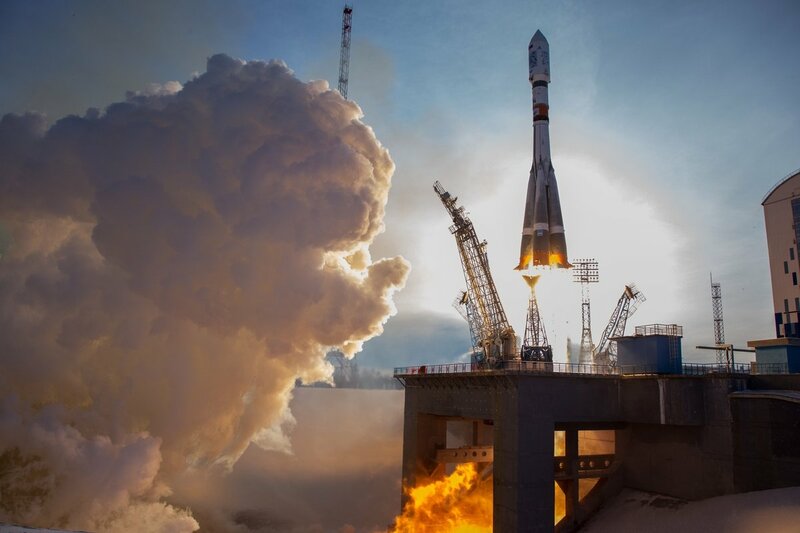 The flight was also the 16th launch of a variant of Russia’s venerable Soyuz rocket this year from Russian spaceports and the Guiana Space Center in South America, and all but one have been successful. No more Russian launches are expected before the end of the year. After heading towards the north-northwest from Vostochny, the Soyuz-2.1a rocket released a Fregat upper stage to less than nine minutes after liftoff to begin a series of maneuvers to deploy the 28 satellites into three different orbits several hundred miles above Earth. Roscosmos, the Russian space agency, confirmed in a statement Thursday that all 28 spacecraft were released into their targeted orbits. The Fregat upper stage fired seven times, including a final ignition to de-orbit the rocket to burn up in Earth’s atmosphere. The two Kanopus satellites separated from the Fregat upper stage at 0306 GMT (10:06 p.m. EST) and 0312 GMT (10:12 p.m. EST) — roughly an hour after liftoff — followed by more Fregat engine firings to place the 26 secondary payloads into two different orbits. Owned by Roscosmos, the Kanopus-V 5 and 6 spacecraft each weigh around a half-ton, and they carry cameras to image Earth in black-and-white and in color for Russian government agencies. 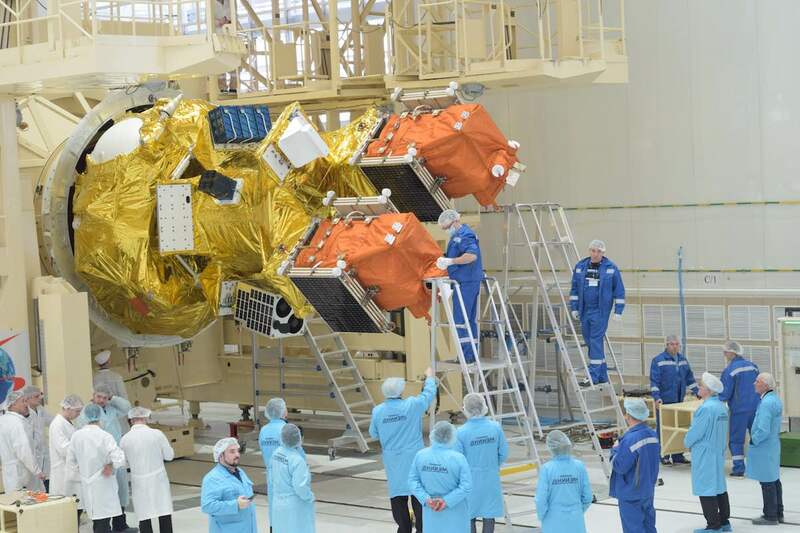 They satellites are similar to a pair of Kanopus spacecraft launched in February on the most recent Soyuz flight from the Vostochny Cosmodrome. The Fregat upper stage aimed to drop off the twin Kanopus satellites in an orbit around 324 miles (522 kilometers) in altitude, before reigniting to release a dozen more small satellites in an orbit around 363 miles (585 kilometers) between 0433 GMT (11:33 p.m. EST) and 0450 GMT (11:50 p.m. EST), according to Roscosmos. 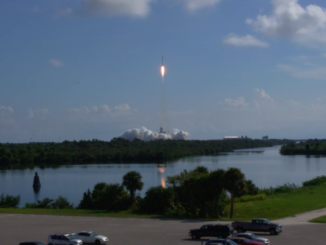 The payloads separated in the second orbit included eight nanosatellites for Spire Global’s fleet of spacecraft collecting atmospheric data and tracking global movements of ships and aircraft. With the satellites deployed Thursday, Spire will have successfully launched more than 80 shoebox-sized satellites since 2015. Spire has its corporate headquarters in San Francisco, a nanosatellite manufacturing facility in Glasgow, Scotland, and offices in Luxembourg and Boulder, Colorado. Spire’s satellites measure temperatures, pressures and moisture in the atmosphere by studying how air particles disrupt GPS navigation signals, and Spire demonstrated earlier this month it could collect atmospheric data using signals from Europe’s Galileo navigation fleet. The company has a contract with NOAA to supply weather data for meteorologists to evaluate in concert with information gathered by conventional government-owned weather satellites. Spire’s satellites also host radio receivers to track maritime and air traffic worldwide. A pathfinder satellite for a Japanese startup named Axelspace also launched Thursday and separated in the second of the three orbits targeted by the Fregat upper stage. Named GRUS 1, the spacecraft is the first in a fleet of Earth-imaging satellites planned by Axelspace to eventually return pictures of the entire planet every day. It weighed less than 100 kilograms, or 220 kilograms, at launch, according to Axelspace. Axelspace says the GRUS satellites have an imaging resolution of 2.5 meters, or 8.2 feet. The Japanese startup announced earlier this month it raised $22.8 million in additional capital to pay for the construction of two more GRUS satellites for launch in 2020 to continue expanding the Earth-observing network, called AxelGlobe. Two CubeSats developed by German Orbital Systems, based in Berlin, were also aboard the Soyuz launcher Thursday. One of the CubeSats, named iSat, was built for the Czech company iSky Technology and carries an ADS-B receiver to track aircraft positions. The other nanosatellite, named D-Star One Sparrow, is an internal project for German Orbital Systems to demonstrate new smallsat technologies. The University of Würzburg’s fourth experimental CubeSat, known as UWE 4, carries a miniaturized electric propulsion system to be demonstrated in orbit, and also serves as an educational tool for the German university’s engineering students. The final set of 14 satellites, including the 12 Dove nanosatellites for Planet, deployed in an orbit around 308 miles (495 kilometers) above Earth between 0613 GMT (1:13 a.m. EST) and 0643 GMT (1:43 a.m. EST) after more orbital adjustments by the Fregat upper stage, Roscosmos said in a post-launch press release. 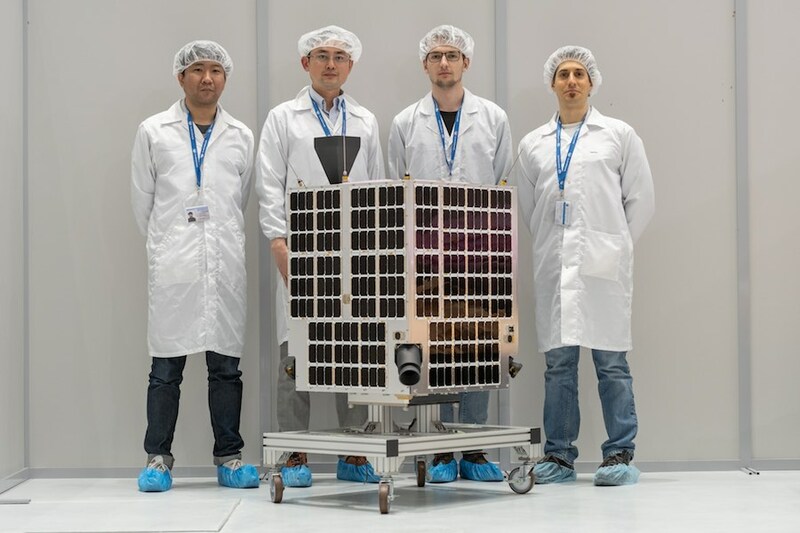 The 12 Planet-owned CubeSats, dubbed the Flock 3k series, join more than 100 spacecraft in Planet’s fleet dedicated to quick-response Earth-imaging. Thursday’s launch was the third to carry Planet payloads into orbit in four weeks from three countries, following successful flights aboard India’s Polar Satellite Launch Vehicle on Nov. 29 and a SpaceX Falcon 9 rocket Dec. 2. The other satellites deployed in the Fregat’s final orbit were ZACube 2, a South African CubeSat, and the Lume 1 CubeSat from Spain. Equipped with an AIS receiver to monitor ships and a medium-resolution near-infrared camera to track maritime traffic and detect wildfires, ZACube 2 was developed by the French South African Institute of Technology and the Cape Peninsula University of Technology near Cape Town. Lume 1 comes from the University of Vigo and a spinoff Spanish company named Alén Space, and is also designed for the early detection of wildfires.